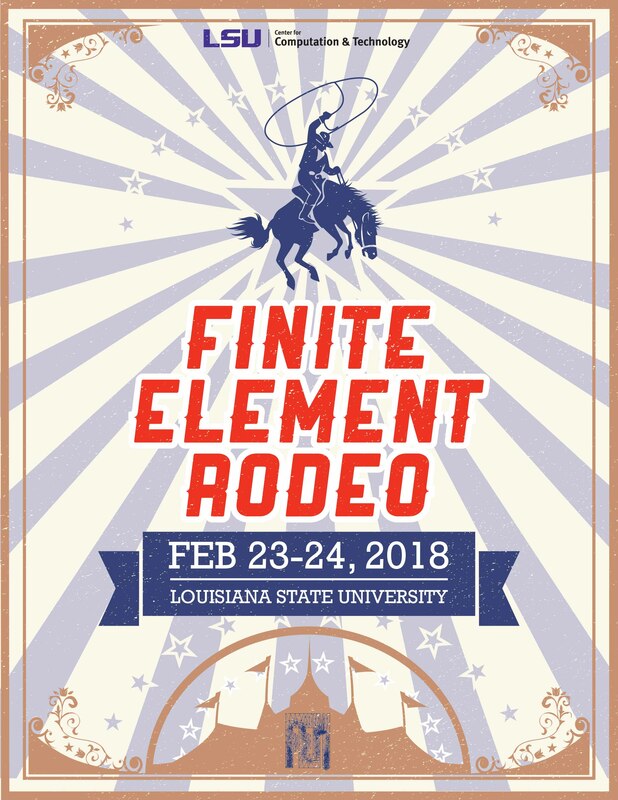 The Finite Element Rodeo will be held at Louisiana State University on February 23-24, 2018, hosted by the LSU Center for Computation & Technology. The Finite Element Rodeo is an important, regional, annual conference that brings together researchers and students interested in the implementation and theory of the general class of finite element methods (FEM) for various applications. FEM plays a crucial role in simulation of engineering, physical, biological, and other scientific phenomena. A driving force for its success has been its mathematical analysis, which has led to novel competitive methods and significant improvements to existing methods. Like regular Rodeo meetings, the program will consist of randomly ordered talks volunteered by conference participants. We invite faculty, staff and students to sign up to give a short talk, or to just attend. SCHEDULE: CLICK HERE to view the schedule. Talks will be 15 minutes (including questions). Time and Location: The Friday session will take place from 1:30 PM to 6:00 PM and the Saturday session will start at 8:00 AM. All talks will be held in the Digital Media Center Theatre. Click here for directions. Travel: The closest airport is the Baton Rouge Metropolitan Airport (BTR). American, Delta, and United operate frequent jet flights to and from BTR to hubs in Atlanta, Charlotte, Dallas-Ft. Worth, Houston, and Memphis. Another option for flights is the Louis Armstrong New Orleans International Airport (MSY), which is approximately 75 miles from the LSU campus. PARKING: Parking is available in the lot (#X116) nearest the Digital Media Center (#341) located off East Parker Drive. Click for map (on the map key it is area L23). If you will be driving and do not have a LSU parking tag, please let us know when you register by selecting the "Parking tag needed" box. GROUP MEAL: A group dinner will be held on Friday evening (6:30PM), February 23rd, at Mike Anderson's Seafood Restaurant located near campus (1031 West Lee Drive). Dinner will include a house salad, main course, stuffed potato, garlic bread, dessert and iced tea. Cost (including gratuity) is $37.21 per person (adult beverages: at additional cost). You can sign up when registering or email jennifer@cct.lsu.edu. Please make checks payable to "Louisiana State University". Mail to: LSU Center for Computation & Technology, c/o Jennifer Fontenot (Rodeo), Digital Media Center Room 1045, Baton Rouge, LA 70803 (to arrive by February 8th). [If you haven't mailed your check yet, please pay onsite with check or exact cash!] Click here for a google map to Mike Anderson's. For more information or questions, please contact sbrenner (at) cct.lsu.edu.